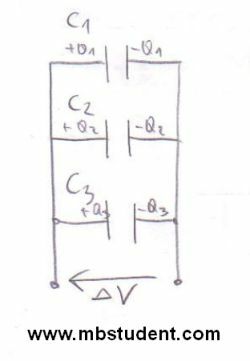 Capacitance C is a one of basic parameters of electric circuits next to resistance R and inductivity L. Capacitance C is defined as relation of charge Q to voltage V → C=Q/V. The measurement unit of capacitance is Farad → [C]=1F, Farad is a derived unit of SI system. 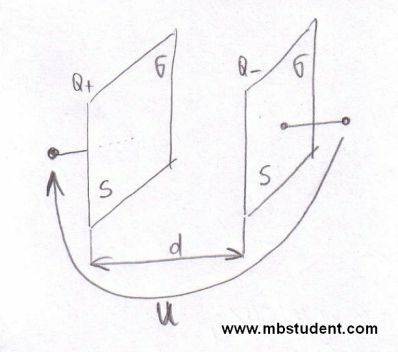 Sometimes it is essential to calculate capacitance of electrical circuit which contains a few capacitors in its topology, therefore, it is often said that total capacitance of electrical circuit is computed. Sometimes during circuits analysis a subject is to calculate the total capacitance which is seen from specific circuit’s terminals. Electrical circuit contains three capacitors which are connected in series and they have different values. 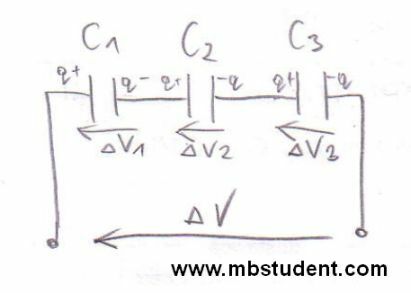 The subject is to designate total capacitance of capacitors connected in series. Every capacitor will have the same electrical charge Q collected on its electrodes because capacitors are connected in series. On the first electrode it will be +Q electrical charge and on the second electrode it will be -Q electrical charge. Total capacitance of circuit is marked as CX. Electrical circuit contains three capacitors which are connected in parallel and they have different values. The subject is to designate total capacitance of capacitors connected in parallel. Every capacitor will have the same voltage between its electrodes because capacitors are connected in parallel. Capacitors will have different electrical charges collected between its electrodes but they all will have the same voltage between electrodes since they are connected in parallel. Total capacitance of circuit is marked as CX. Electrical circuit is built with four capacitors which have different values. The subject is to designate total capacitance of electrical circuit which is seen from power supply terminals. 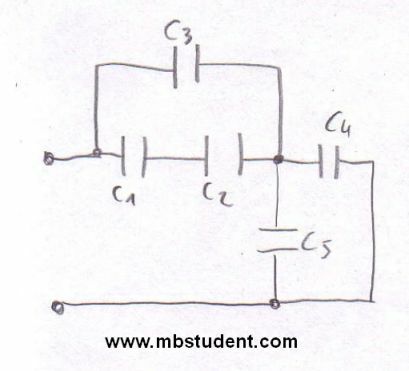 Capacitors are connected in circuit in mixed ways since two of them are connected in series and another two are connected in parallel. Total capacitance of circuit is marked as CX. Electrical circuit is built with five capacitors which have different values. The subject is to designate total capacitance of electrical circuit which is seen from power supply terminals. 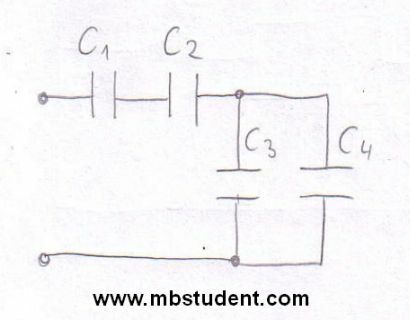 Capacitors are connected in circuit in mixed ways since two of them are connected in series and another two are connected in parallel, therefore, for some specific branches in circuit a capacitance of series connection of capacitors has to be calculated and sometimes capacitance of parallel connection of capacitors has to calculated too. Total capacitance of circuit is marked as CX. Electrical circuit contains seven capacitors in its topology. Every capacitor has different value. The subject is to designate total capacitance of electrical circuit which is seen from power supply terminals. 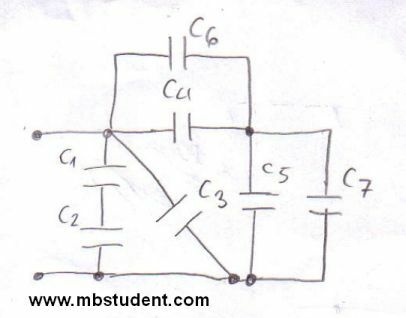 Capacitors are connected in circuit in mixed ways since two of them are connected in series and another two are connected in parallel, therefore, for some specific branches in circuit a capacitance of series connection of capacitors has to be calculated and sometimes capacitance of parallel connection of capacitors has to calculated too. Total capacitance of circuit is marked as CX.